to provide a perfect atmosphere of relaxed elegance. Catherine stands out from the crowd with the warmth and vitality of her natural artistry, wide experience, and selection of music which always suits the occasion. She has entertained notables from Frank Sinatra to the Prince of Wales, and has frequently played for British and foreign Royalty, including Prince Charles’s recent 60th birthday celebrations. From her home near Cheltenham, she covers the area from Bristol to Birmingham and the West Midlands, including Gloucestershire, Worcestershire and the Cotswolds. 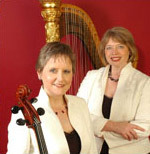 She also plays in the Cotswold Flute and Harp Duo and Blue Flamingo (cello and harp duo). Please explore the website to learn more! 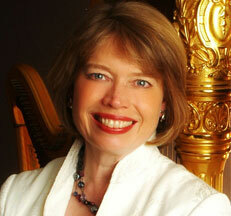 Two new versions of a delightful CD by a spectacular ensemble of 16 international harpists. 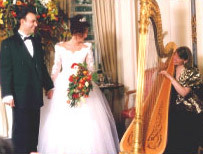 ©Copyright Harp Serenade 2008. All rights reserved. site designed by Design Lynx Ltd.